Fountain Civil Engineering (FCE), founded in 1994, is a multi disciplined civil engineering construction company. FCE is one of the leading contractors in the KwaZulu-Natal region. The company opened an office in Gauteng in 2010 and in Kathu in 2011. Over the past 20 years, FCE has assembled a highly trained team that is both quality conscious and motivated to achieve targets and stated goals. FCE is about problem solving all your construction needs from sewer and water reticulation, to roads, bulk earthworks, township infrastructure, to the very complex landfill construction and gas extraction. FCE is dedicated to creating a better environment and has built an enviable track record in the specialised field of landfill construction. Whether constructing a new landfill site or closing and rehabilitating existing ones, the company"s aim is to effectively prevent the access of contaminants from everyday waste into our environment and underground water systems. Due to this experience, FCE has become the foremost landfill specialist in KwaZulu-Natal. FCE has also become actively involved in the construction of a number of landfill gas extraction projects. eThekwini Municipality recognized the need to control landfill gas emissions at the Bisasar Road and Mariannhill waste sites as these sites are in and near to urban areas and already had some active landfill gas extraction and flaring. Working together with eThekwini Municipality and other project partners, FCE has been involved in capturing the methane rich landfill gas from three landfill sites to provide fuel for the production of 7.5 MW of electricity. The gas is captured by sinking wells deep into the waste body and through inter-connecting pipes linked to an underground main gas collector and extracted via a blower system, which maintains a vacuum in the pipes resulting in the gas being extracted from the waste to where it can be effectively utilized. Electricity at the Bisasar Road landfill compound is generated through purpose built 1-MW engines and is currently generating a total of 6,5 MW with a further 1-MW engine at the Mariannhill Landfill site, totaling 7,5 MW. The entire project, which includes the initial Mariannhill and La Mercy sites, is the first landfill gas CDM project in South Africa. As well as making use of the methane gas to generate electricity from rubbish, greenhouse gas emissions are reduced from the landfill. Consequently, FCE with its partners in this field, are able to offer a full package from gas well construction through to flare installation and subsequent power generation. Bisasar Road Landfill; Mariannhill Landfill; Rietfontein Landfill; Simmer & Jack Landfill; Weltevreden Landfill; Rooikraal Landfill; 2nd Creek Landfill; Marie Louise Landfill; Beatrix Gold Mine; KwaDukuza (Stanger) Landfill; Endumeni (Dundee) Landfill; Shongweni Landfill; and Earthworks, Roads and Infrastructure. FCE was nominated as the main contractor for the Phase 1 development of approximately 95ha of the Cornubia Industrial and Business Estate (CIBE) which forms part of the 1300ha Cornubia Precinct. The works entailed the construction of the building platforms for the industrial and commercial development which goes hand in hand with creating job opportunities for the local community. The bulk earthworks operation was carried out to form approximately 28 building platforms of various sizes before the installation of the civil infrastructure. In order to service the various platforms, a 500mm diameter steel pipeline was installed bringing water to the area from the Woodview Drive, Phoenix Reservoir area. Tongaat Hulett Developments: an access road and bridge into CIBE. Numerous cells at Bisasar Road, Marianhill and Buffelsdraai Landfill sites. Arcellor Mittal SA - various landfill and related projects. Assmang: Slag Disposal Facility & Stormwater Retention Dams and many more. 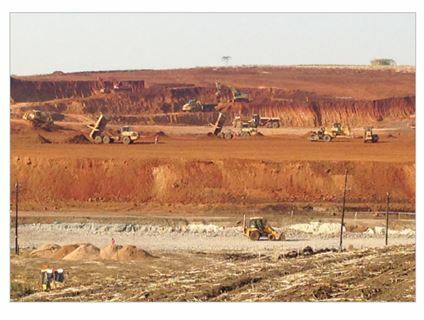 Kumba Iron Ore Company: Rehabilitation work of mine dumps (multi-year contract). Construction is a people"s business and the credit for the success of FCE must go to the team of people that it employs and that belong to this company. Along with the over 200 years of construction experience in the senior management team, the extremely experienced and competent estimating department ensures well considered prices and a constant supply of work. FCE are able to provide a turnkey operation, from concept design, finance sourcing, CDM registration and EIAs, through to construction, installation and finally operation and maintenance. With FCE"s stringent safety policy and Dekra proved Quality Management system together with other policies encompassing; social responsibility, employment equity and affirmative action, equal opportunity, commitment to skills development and the continued effort to uplift the staff, the company has gained the respect and trust of all the stakeholders in its business. With the move to use public private partnerships, FCE adds value to the construction industry, and the teams of professionals have the necessary skills and experience to meet this challenge. The experienced staff will deal with service providers, local municipalities, property owners and any other stakeholders to ensure the smooth transition of your project from inception to handover maintaining FCE"s focused approach TO BE THE BEST in its field. Industry Quality Standards: FCE is also proud to be ISO 9001:2008 accredited and is committed to the highest standards of quality in everything they do. An Environmental Division has recently been established in pursuance of ISO 14001 rating. To become an institution that is truly South African with total commitment to good corporate governance and excellence. Ensure our company"s competitive advantage and build shareholder value by keeping a strong focus on the bottom line, while doing justice to our philosophy. Ensure that our company is the organisation of choice to clients through good workmanship, safety, value for money and service excellence.